Since I have never painted a guitar before, I felt I needed to run at least one experiment before getting to work on the real thing. To this end, I bought a super-low end, unfinished Telecaster body (made from alder) and I will try to do approximately what I wish to do on the real project. Also, in the spirit of science and in the tradition of failing fast, I’ll document this effort here even if it is a colossal debacle. I plan to throw this one away so if it looks even halfway decent, that’s a win. Basically, I am trying to work out which primer to use, which paints work well, how to sand, how long to let dry, etc. Here is a shot of the guitar on the stand. 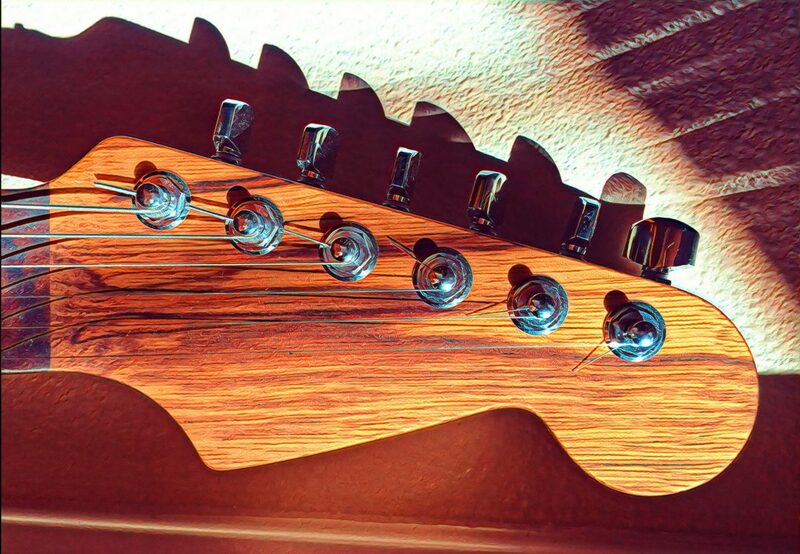 The basic idea is to position the nails so they support the guitar in places which will not be seen. On the top, these are the string holes and the neck pocket. On the back, it is again the string holes and under where the neck plate will go. Then I primered the guitar, using a flat white primer. Finally, after a quick sanding of the primered guitar, I started the first coats of paint. The idea is to put on these two colors, wait until dry, add some non-stick material (I plan to use dish soap), and paint again a different color. Then remove the soap for a glorious and interesting pattern. Tomorrow I’ll get to the next stages and post more photos. I have noticed two things in this experiment already. First is just how difficult it is to paint a surface and keep it dust free (I am painting in my garage). The second thing is that I think the clear coat is going to be too toxic for me to apply in an enclosed and poorly ventilated space. So I am investigating whether I can find a professional to clear coat the guitar when I am done painting. Update: Keith Holland’s Guitar Hospital says they can do a professional hard clear coat on a painted guitar body.